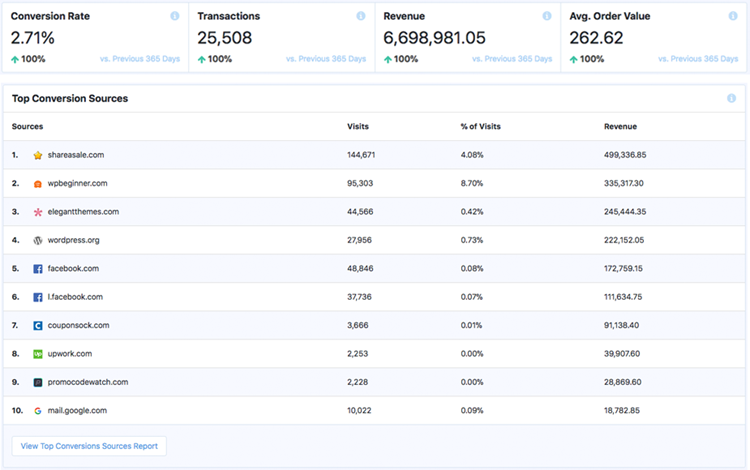 MonsterInsights Review 2019: Is It the Best Google Analytics Plugin? Home » Plugins » MonsterInsights Review 2019: Is It the Best Google Analytics Plugin? Looking for the best Google Analytics plugin for your WordPress site? Even if you’re not a numbers person, you know analytics are important: basing your strategy on real data is the most effective way to grow your site. Our MonsterInsights review will show you how this plugin can give you the actionable data you need. If you’ve used Google Analytics before, you know that it’s a powerful tool with lots of valuable data — but it can be completely overwhelming. If you’re not an analytics expert, it can be very difficult to know where to start, or how to put that data to use. And what’s the point of analytics if you’re not using the data to improve your site? For most users, you just need a tool that shows you the most important data at a glance, in an easy to understand format. Data that you can put into use right away to improve your site. If you’re an expert Google Analytics user, you can do that without a plugin. But a plugin like MonsterInsights will give you all that information at a glance, making analytics easy even if you’re a beginner. MonsterInsights is also much easier to set up than Google Analytics. A beginner to WordPress may not know how or where to place the tracking code. But setup with MonsterInsights is much easier — you don’t have to edit any code on your site. MonsterInsights was originally developed by Joost de Valk, the developer behind Yoast SEO. As Yoast grew they decided to focus on SEO products exclusively, and the Google Analytics by Yoast plugin found a new home in 2016 with Syed Balkhi and was rebranded as MonsterInsights. MonsterInsights now has a single goal: to make analytics easy for beginners. MonsterInsights is brought to you by the same team that’s behind WPBeginner, OptinMonster, and WPForms. Note: You will have to have a Google Analytics account already created before setting up this plugin. Install and activate the plugin, and then navigate to Insights » Settings. Here you can connect your Google Analytics account without having to edit any code. 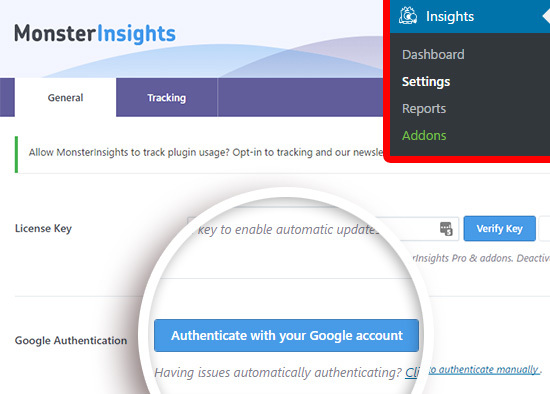 Log in to your Google account and click the Allow button to grant MonsterInsights access to your analytics data. Then copy the authentication code it generated for you. Paste the code in the popup field in your WordPress dashboard, and again click the Next button. 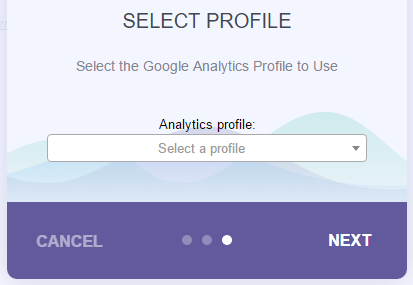 Now you can select an analytics profile from the dropdown, and then click Next. When you’ve chosen your options, click the Save Changes button at the bottom. That’s it! Now when you click on Insights » Dashboard, you’ll see your traffic stats displayed. Are you still not convinced about using an Analytics plugin like MonsterInsights when you can set it up without a plugin? Below are a few reasons your website needs MonsterInsights. MonsterInsights makes Google Analytics setup easy. In just a few clicks, you can connect your website with Google Analytics without having to touch a single line of code. While it’s easier to set up basic Analytics tracking to gather data like sessions, pageviews, bounce rate, etc., the basic setup doesn’t allow you to enable enhanced tracking reports including but not limited to eCommerce tracking, form tracking and download tracking. With MonsterInsights, you don’t have to worry about skewing your data because you’re not required to touch any code during the setup. 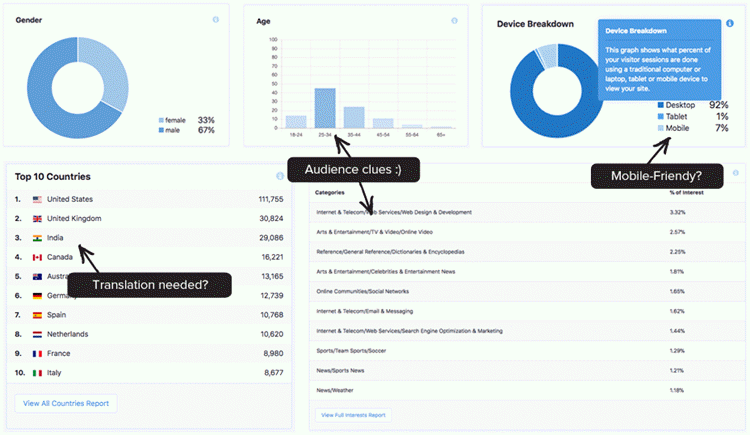 Google Analytics reports are comprehensive but they can also be overwhelming at times. This also means that if you’re not an Analytics expert, you may find it difficult to make informed decisions from your entire Analytics reports. Without a doubt, if you want to make informed decisions for your business, then you need to learn the art of separating the wheat from the chaff—getting the right stats that matter to your business from your overwhelming Analytics reports. That means even if you’re not an Analytics expert, MonsterInsights helps you easily make data-driven decisions that can have a positive impact on your business. With MonsterInsights, you can see your site’s performance at a glance right in your WordPress dashboard. If you want to check out how your website is performing, then you’re not necessarily required to log in to your Google Analytics account every day. Instead, you can easily figure it out by simply logging into your WordPress dashboard. How Does MonsterInsights Stack Up Against the Competition? You can find tons of different visitor tracking plugins in the WordPress plugin repository that let you gather your website statistics and give insights into how your websites perform when it comes to attracting visitors to your site and converting them into customers. After comparing MonsterInsights with a few different WordPress Analytics plugins, below are a few things we like about MonsterInsights. User experience is the single most factor that sets MonsterInsights apart from its competition. Not only will you find it extremely easy to set up, but its tracking settings and workflows establish itself as the most beginner-friendly Google Analytics plugin for WordPress. No need touch any code for setting up Google Analytics on your site. If you can point-and-click, then you can use MonsterInsights. Whether you’re a publisher, an eCommerce merchant or a small business owner, you’ll find MonsterInsights useful alike. For instance, if you run a WooCommerce store, then you may know that you could find dozens of WooCommerce-specific Analytics plugin that help you track your customer interactions. The downside with those product-specific plugins is that they limit your ability to leverage the full possibility of Analytics tracking. In this example, you won’t be able to track optin form submissions, download tracking, and many other events tracking that’s not directly associated with eCommerce. On the other hand, since MonsterInsights is a fully featured Analytics plugin, you can track a lot of events on your website that matters to your business. See the full list of MonsterInsights features. 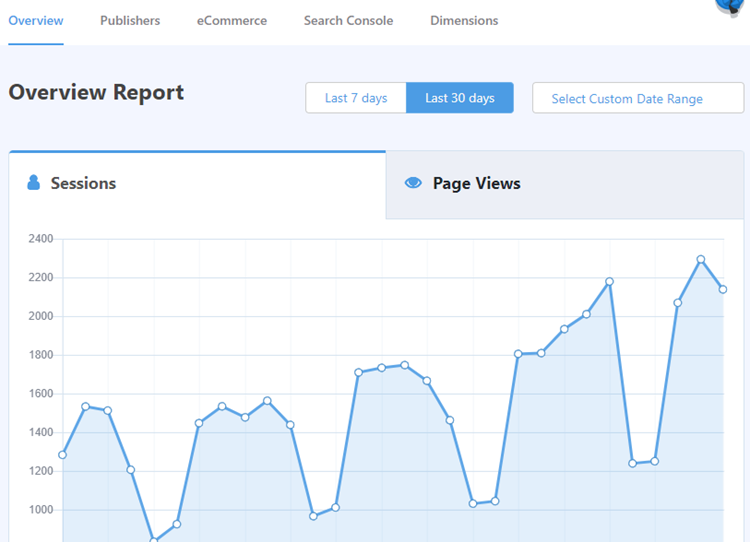 With almost 15 million downloads and over 1 million active installs, MonsterInsights is the most popular Google Analytics plugin for WordPress. Due to the fact, you can find a lot of free third-party addon plugins in the official plugin repository that lets you easily enhance the Analytics tracking features. For example, here’s a free third-party addon plugin that supports MonsterInsights. Jetpack Stats, for example, requires you to connect your site with WordPress.com, in order to start enabling the site tracking feature. For those users who don’t want to share traffic stats with WordPress.com, it’s impossible to use Jetpack Stats. On the other hand, Google is sending you a lot of your traffic via search, so they already know about your visitors. MonsterInsights simply connects your website with Google Analytics, so you don’t need to create another account. Another thing we like about MonsterInsights is that it fits in your budget. For instance, if you’re a publisher who want to know how your website performs on Google AMP enabled pages or Facebook Instant Articles, then you just need to subscribe to their Plus plan. Additionally, if you want to enable eCommerce tracking as well, you can get the Pro version. But what if you don’t have a budget for an Analytics plugin? No worries! A free lite version is available to download from the official repository. Before you purchase the premium version, you can try out the lite version first. It goes without saying that MonsterInsights is the best plugin regardless of the size and budget of your online venture.